(complete Kidney failure) plus another operation ... however I will try to better maintain the MVPS HOSTS file. If you could ... please consider a donation. Thanks to all that contributed ... every little bit helps. Using a well designed HOSTS file can speed the loading of web pages by not having to wait for these ads, annoying banners, hit counters, etc. to load. This also helps to protect your Privacy and Security by blocking sites that may track your viewing habits, also known as "click-thru tracking" or Data Miners. Simply using a HOSTS file is not a cure-all against all the dangers on the Internet, but it does provide another very effective "Layer of Protection". In case you're wondering ... this all happens in microseconds, which is much faster than trying to fetch a file from half way around the world. Another great feature of the HOSTS file is that it is a two-way file, meaning if some parasite does get into your system (usually bundled with other products) the culprit can not get out (call home) as long as the necessary entries exist. 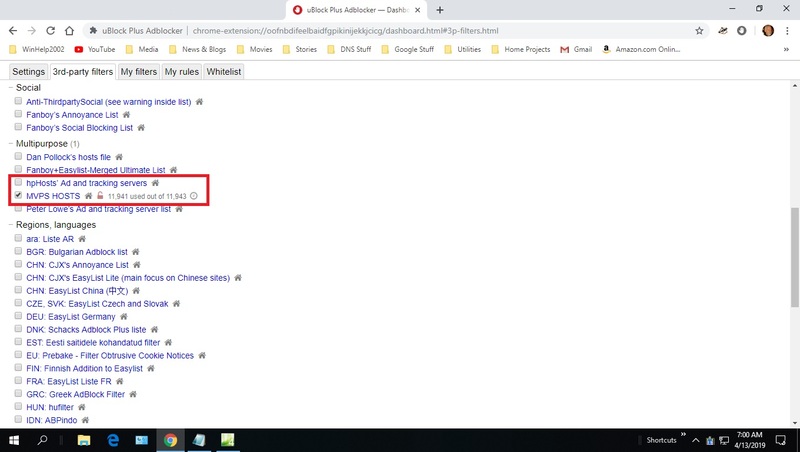 This is why it's important to keep your HOSTS file up to Date. Get notified of MVPS HOSTS updates. Special Note: new Windows 10 users ... the MVPS Hosts file installs just fine, no need to make any changes. Important Note: The HOSTS file now contains a change in the prefix in the HOSTS entries to "0.0.0.0" instead of the usual "127.0.0.1". This was done to resolve a slowdown issue that occurs with the change Microsoft made in the "TCP loopback interface" in Win8.1. You can use the "Replace" function in Notepad to convert the entries, or either of these freeware utilities (see below) has an option for converting the entries from "0.0.0.0" to "127.0.0.1. When you run the (mvps.bat) batch file - right-click and select: Run as Administrator. Once updated you should see	another prompt that the task was completed. 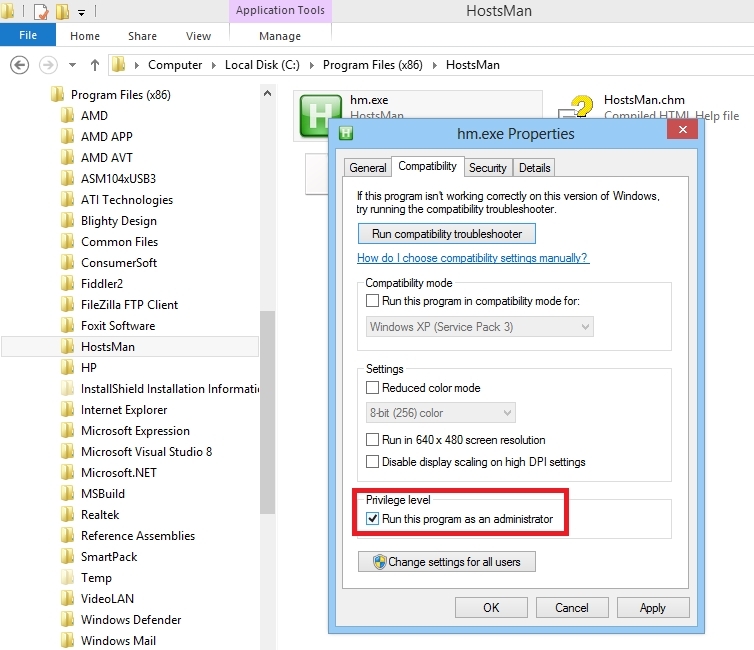 Some users may see a pop-up from certain Security programs about changes to the HOSTS file. Allow the change ... however if you see this pop-up (changes to the HOSTS file) at any other time ... investigate. Note: the below locations are for the typical default paths, edit as needed. 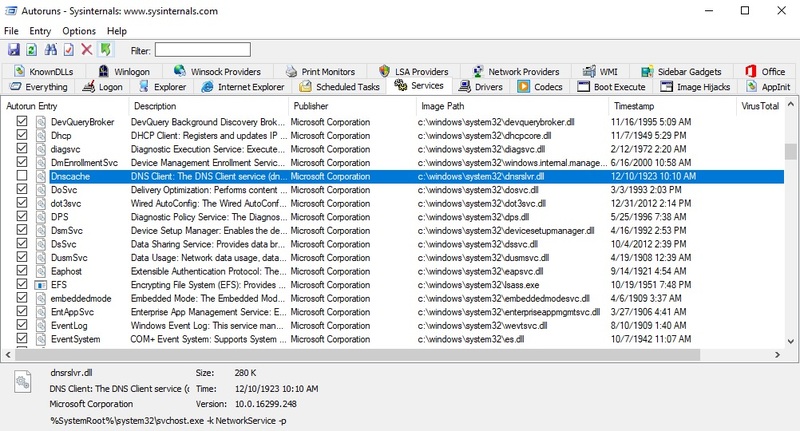 From sysinternals.com download the latest version of AUTORUNS ... it doesn't require any installation. Run autoruns64.exe as ADMINISTRATOR and wait until it finishes it's scan. Go to the Services tab, scroll down to the Dnscache entry and clear (uncheck) the checkmark. You can FILE / SAVE, to save a copy of the new configuration settings. 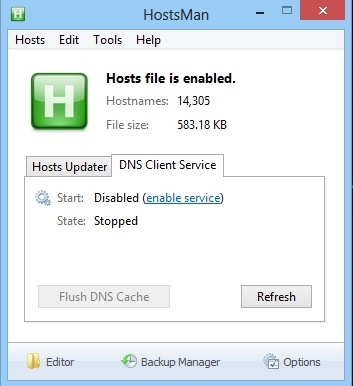 If you decide that you want the DNS Client service running ... You can make a little batch file that will flush the DNS whenever you desire. Then File > Save As > change the file type to All files, and name the batch file to flushdns.bat and place it in your Windows folder. Locate flushdns.bat right-click and select Send To > Desktop as shortcut. Rename the HOSTS file on the fly ... a simple one click batch file. PowerShell script to automatically download, unzip and update the local host file. AdBlock by FutureMind (paid app $2.99) Enables hosts file to be loaded into unrooted/non-jailbroken iPhones and iPads. Thanks to everyone involved for providing the online update notices for the HOSTS file. These updates are posted to most major security related sites, Newsgroups, and mailing lists, blogs etc. Get notified of MVPS HOSTS updates.